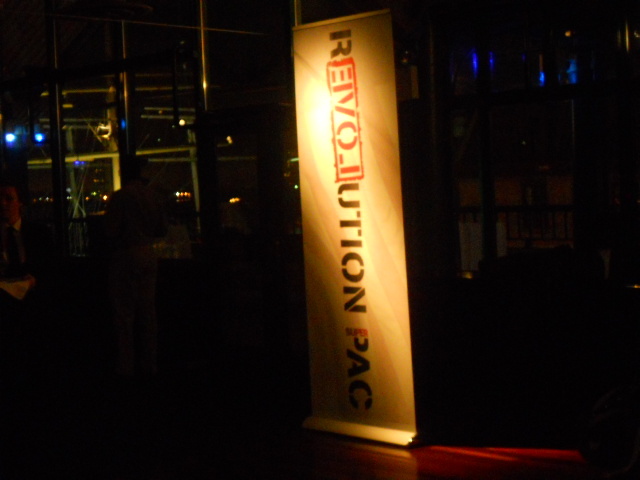 The RevPac event I attended on Monday night was an quite an experience. 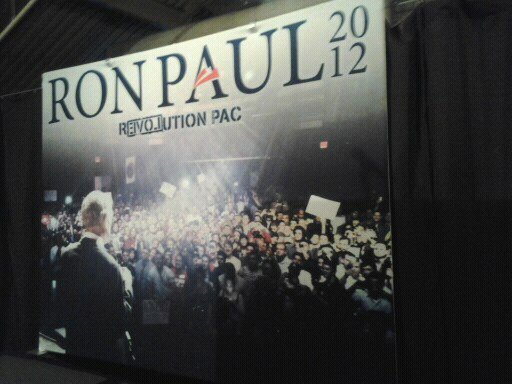 First of all, the choice of setting seemed designed to highlight some of the recurring themes in Ron Paul’s presidential campaign. While most of his primary opponents have held Manhattan fundraisers targeting donors in this city’s ever-dwindling, yet still potent, financial services sector, the rigidly anti-corporatist, free market dogma of the Paul campaign-highlighted by the appearance of bearish Euro Pacific CEO Peter Schiff-lent a new dimension to what would otherwise have been a routine campaign fundraiser. 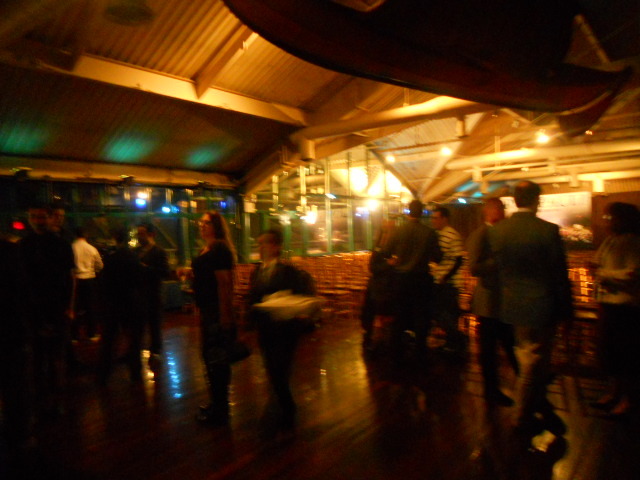 The optics of the event were pleasing, which I suppose was by design. Even on an ordinary day, the South Street Seaport, bordering the nearby Financial District, is one of the pleasing parts of New York City. But on the cusp of Christmas, one of the more beautiful historic districts in Manhattan really comes to life. 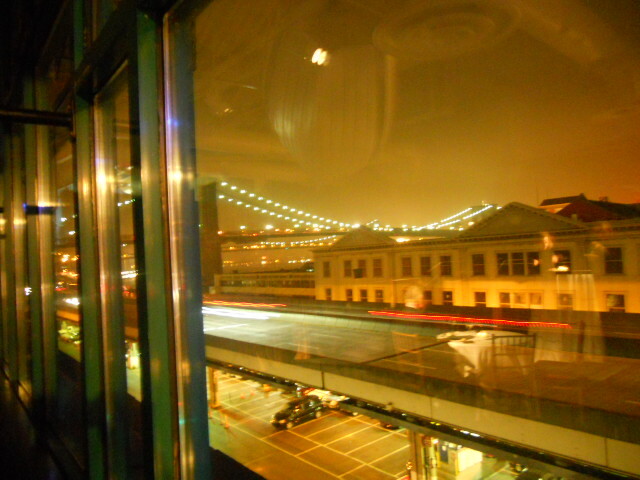 The South Street Seaport Museum is a beautiful reminder of New York’s proud naval heritage. 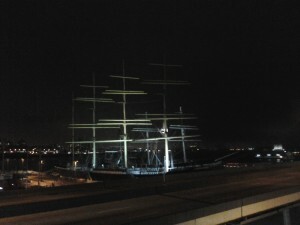 The Peking, pictured below, is a four-masted barque that was built in Hamburg, Germany. 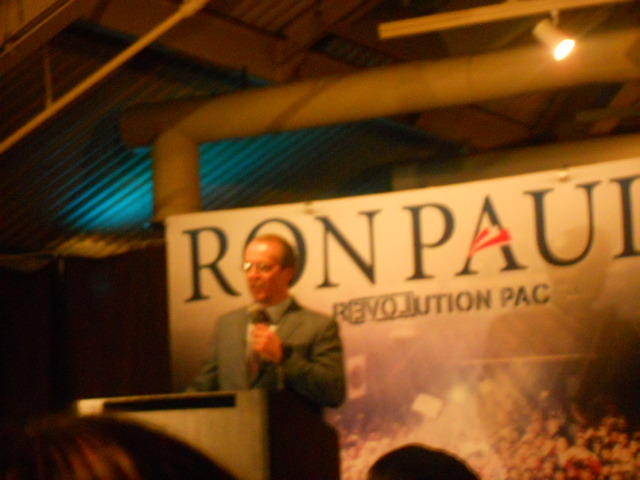 The evening’s host, professor of finance at Ramapo College and New Jersey Republican and Libertarian candidate Murray Sabrin, utilized the opportunity provided by the location in order to compare Ron Paul to a captain who would right a ship-in this case, the United States-veering off course. Although the analogy was a bit labored, the sentiment it expressed seemed to be well received by the audience. Before the evening’s official schedule began I was able to chat with some Ron Paul supporters, mostly about the dire economic situation the United States is facing. The staggering corporate misfeasance by former MF Global head Jon Corzine was a topic of particular interest to some of the investors RevPac was courting that night, although I also overheard some attendees discussing the career of Bret Favre. Unfortunately, that is one topic that probably won’t go away, regardless of who is elected POTUS a year hence. 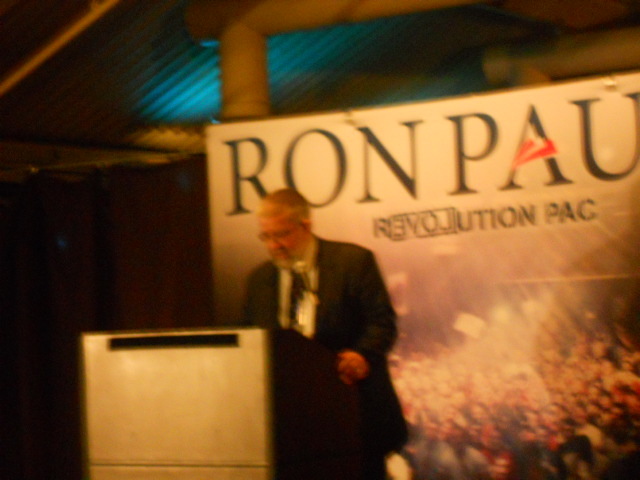 Dr. Sabrin set the tone for the evening, using his introductory remarks to counter what he felt were unjustified, inaccurate attacks leveled against Ron Paul by his critics. He set aside for specific condemnation the leaders of the Republican Jewish Coalition, who’ve decided to exclude Paul from an upcoming presidential forum, and conservative evangelical leaders such as Family Research Council head Tony Perkins, who’ve dismissed the Paul campaign in the past. I must admit, one of the more surprising elements of the RevPac fundraiser was the emphasis some of the speakers gave to issues of faith-including several strong religious references-an element I hadn’t antcipated in this type of setting. The subjects addressed by each speaker fell roughly into three broad areas: warfare and diplomacy, budget and economy, and constitutional limitations. 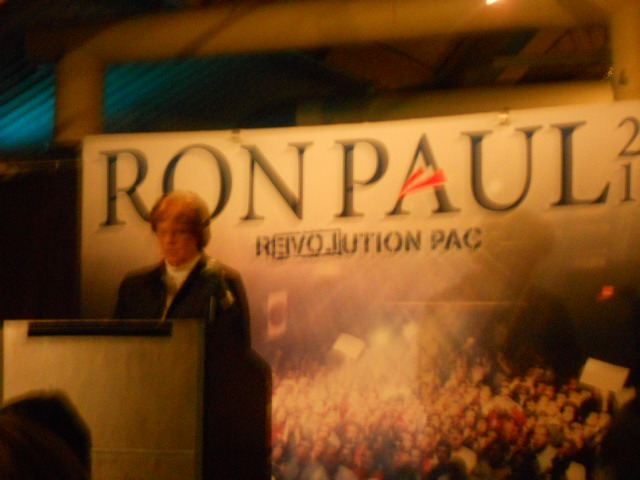 Dr. Alieta Eck, president of the American Association of Physicians and Surgeons, focused on the latter two, exploring why Ron Paul’s opposition to PPACA-and promise to sign a repeal of Obamacare into law should he become President-was essential to improving the health care delivery system. She described the difference in approach between Newt Gingrich, who lobbied for changes in government policy that would benefit his health care clients, and Paul, who has recommended policy changes like negative outcomes insurance, health savings accounts, and a reduction in the scope of FDA regulatory authority. Kevin Gutzman, Professor of History at Western Connecticut State University and author of The Politically Incorrect Guide to the Constitution, used his speech as a platform to synthesize the foreign policy and economic critiques voiced by Ron Paul into a broad Constitutional argument supporting his presidential candidacy. He attempted to make the case that both Mitt Romney and Barack Obama had no genuine regard for upholding the Constitution, and viewed the document-like most politicians-more as a totem than an actual check on Executive or legislative authority. He cited as examples the notorious reply of Elana Kagan during her Senate confirmation hearings to a question posed by Senator Tom Coburn about the extent of authority of Congress, as well as the American-led, NATO intervention in the Libyan civil conflict, which was a non-defensive military operation that in his view flagrantly disregarded the admonition by the Founders not to become enmeshed in foreign military entanglements. Gutzman touched upon the catalogue of Constitutional breaches responsible for our current structural problems, highlighting what he saw as the Supreme Court’s rendering of the Commerce Clause effectively moot, the apotheosis of which is Wickard v. Filburn, perhaps the biggest realignment in individual rights in relation to the state effected by the Supreme Court during the 20th century. The peroration of his speech being, of course, a summary of why Ron Paul was the only candidate capable of and willing to reverse course on these issues. 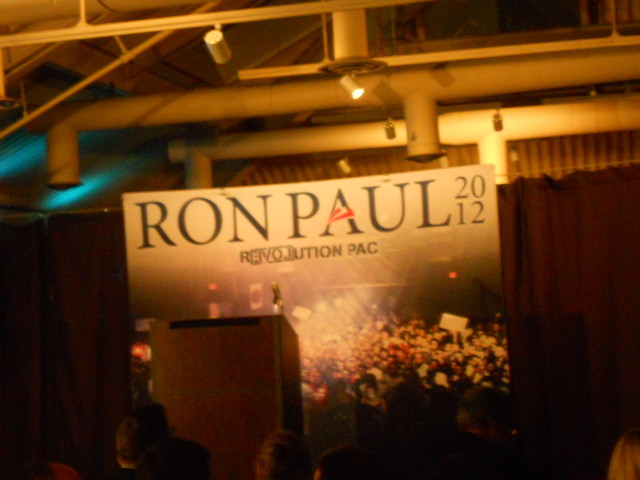 Jim Grant, an economic author and former writer for Barron’s, spent the bulk of his speech attacking the Federal Reserve, emphasizing a chief theme of the Paul campaign. It was framed by the assertion that there had been no progress in economic thinking since 1914, i.e. the year in which the Federal Reserve was created. His speech was in keeping with the spirit of the event in the sense that it was a radical, libertarian critique of the fiscal and monetary system we’ve had in place for the better part of a century. He advocated a return to the concept of double liability and repeal of federal deposit insurance, as well as the reintroduction of the Gold Standard and the end of what he described as the “socialization of risk,” epitomized by programs like TARP. Michael Scheuer was the penultimate speaker, and his speech was one of the more interesting-which is to say odd-of the evening. Professor Sabrin introduced him as the creator of President Clinton’s extraordinary rendition program-which elicited surprisingly few cheers from the libertarian crowd-and the former head of the CIA unit tasked with finding and capturing the late Al Qaeda emir and FBI most-wanted terrorist, Osama Bin Laden. 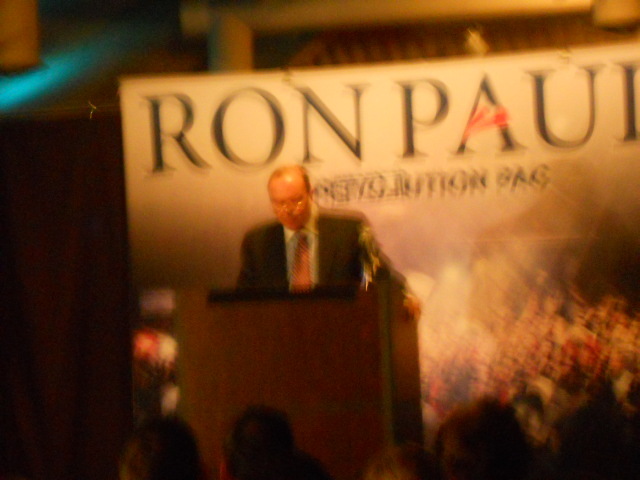 Although most of his talk was taken up with an extended lecture on how our foreign policy has inspired enmity among the Muslim world, primarily through our alliances with Saudi Arabia and Israel, he reserved a section of his speech to address criticisms of Ron Paul made by some Jewish organizations and public figures. The wisdom of trying to refute these accusations, which prominent Jewish supporters of Paul’s presidential campaign have addressed in the past, in the context of a fundraiser is itself a dubious proposition. However, Scheuer’s decision to analogize the attacks against Rep. Paul to what he described as the defamation of Charles Lindbergh and the America First Committee during World War II was a baffling decision, to say the least. Leaving aside the historical debate over how sympathetic Lindbergh was to the aims of Nazi Germany, the fact that he held and voiced anti-Semitic views should have been enough to give Michael Scheuer pause before embarking on this train of thought. 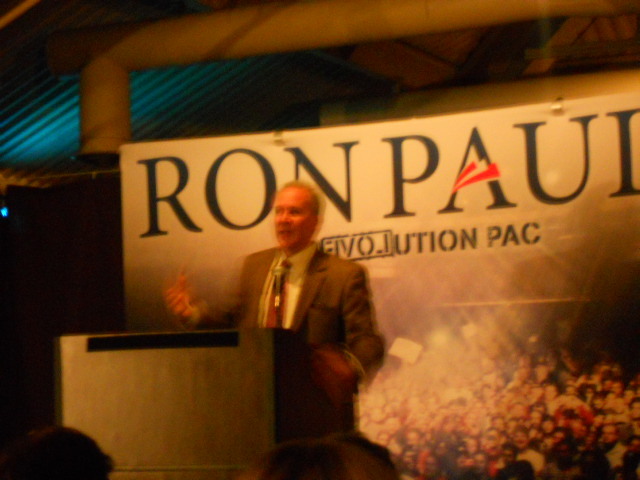 The keynote speaker of the evening was Euro Pacific Capital CEO and libertarian activist/talk show host Peter Schiff. 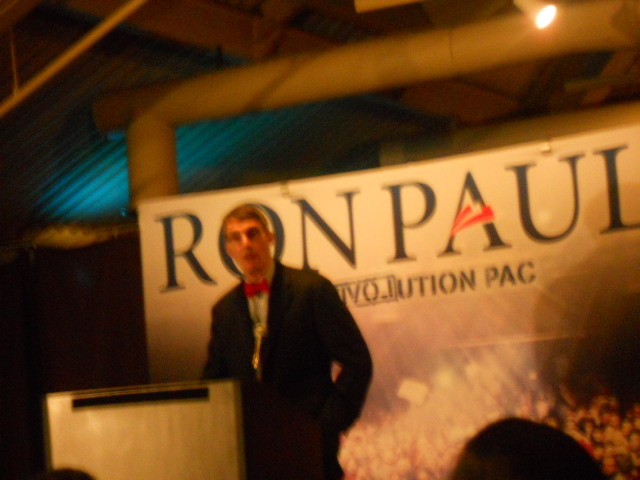 Perhaps appropriately, the capstone of this event was a campaign pep talk, focusing upon the necessity of Ron Paul supporters doing their part to help their preferred candidate win the upcoming Iowa Caucuses and New Hampshire primary. After outlining how his forecasts of an imminent housing bust/recession had been predated by Ron Paul’s equally pessimistic but prescient predictions in Congress, Schiff claimed that the current frontrunners in the Republican field-especially Newt Gingrich-were as evanescent as the real estate boom that preceded our current, prolonged recession. Whether Schiff’s political prediction holds true remains to be seen, but his speech unquestionably inspired those in attendance. Overall, the atmosphere seemed optimistic, possibly because of the weakness of the Republican field and/or the favorable polling coming out of Iowa. Personally, I’m still not convinced that Ron Paul has the momentum to win the GOP nomination, but from a purely intellectual standpoint, he’s probably the most logical alternative for those primary voters seeking the “anti-Romney” at this point in time. 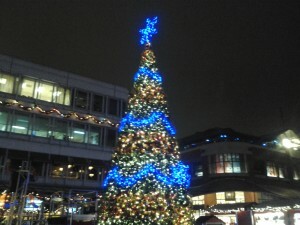 This entry was posted on December 7, 2011 at 2:38 PM and is filed under Analysis, News. You can follow any responses to this entry through the RSS 2.0 feed. Great analysis of the night. I was also a little shocked about the Charles Lindbergh comments as well. Of course, I do not know much about him other than what I learned in high school twenty years ago. I will repeat Schiff’s prediction- the collapse hasn’t occured yet. We have the same system and the fundamentals have actually gotten worse. Everyone wants things to go back to how it was before the bust. I feel not only must things changes, but they will. As an example, I have heard estimates that up to 70% of our economy is based on consumer spending. That is spending money we don’t have mostly on things we don’t need. Look at the recent example that was herald as great news- the biggest black Friday sales in history. What was not mentioned was how the sale offered undercut profits. And what really matters for sustained growth and recovery will be the profits. It depends upon what you mean by the economy. There was a good article in BusinessWeek that explored some of the misconceptions about GDP, but there’s no doubt that the cycle of easy credit and debt-based spending have wreaked havoc on our economy. The worst part is that there are people like Robert Reich encouraging us to dig the hole even deeper, more quickly.